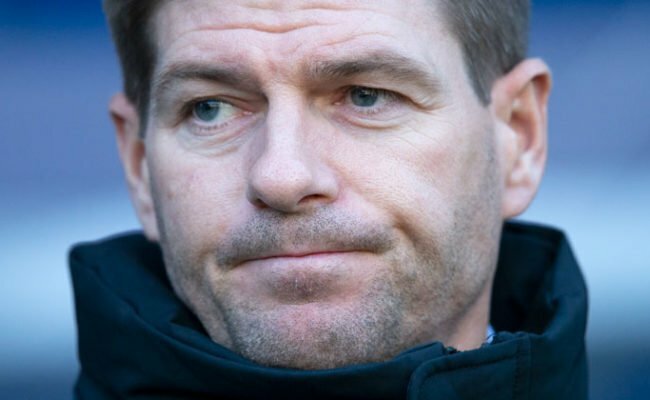 RANGERS made it three wins on the bounce in the SPL with an excellent 3-1 victory over eighth placed St Mirren but this only tells half the story from a match which had just about everything. Lee McCulloch opened the scoring with a fine header after just 45 seconds before Sone Aluko missed the first of FOUR penalties awarded by ref Willie Collum. Rangers looked to be cruising to victory when Andy Little doubled his side’s advantage before half time but the visitors had other ideas. Paul McGowan pulled one back from the penalty spot on 48 minutes but almost immediately the ref had pointed to the spot again at the other end and McCulloch’s effort was brilliantly saved by Samson after Jeroen Tesselaar had been sent off for his challenge inside the box on Sone Aluko. Kyle Lafferty then replaced Salim Kerkar and when McCulloch was hauled down in the Saints’ box by Lee Mair with 59 minutes played it was the substitute that stepped up and sent the keeper the wrong way with a composed finish. It was an incredible afternoon and the result means Rangers moved nine points clear of third placed Motherwell with the Steelmen facing Hibs tomorrow. 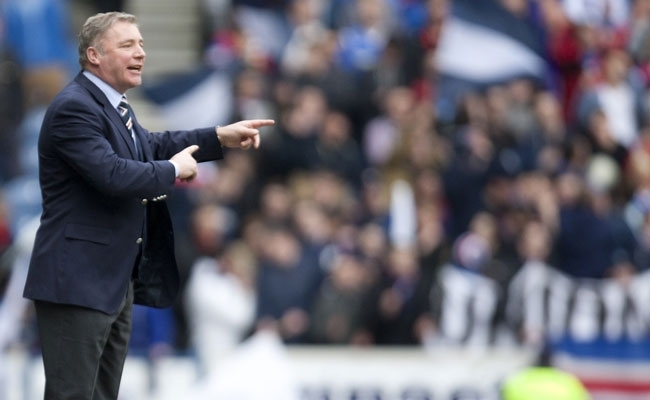 Ally McCoist made three changes to his starting eleven with Carlos Bocanegra, Kerkar and Little returning to face Danny Lennon’s side but it was Fir Park hero McCulloch that got his side off to a flier. The club’s combative number 6 won a free-kick when Mair clattered into him from behind. The challenge left McCulloch dazed but when Steven Davis whipped in a delightful cross it was the former Wigan man that rose majestically to head the ball across Craig Samson and into the net. 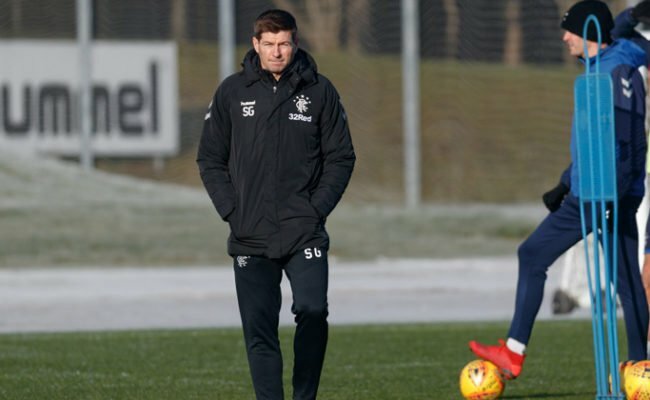 It was the perfect start but on seven minutes McCoist was forced into making his first substitution with Davis going off and Rhys McCabe replacing the skipper who jogged off tentatively. This, however, did not halt Rangers’ early dominance and on 13 minutes and a dangerous cross from Kerkar caused mayhem in the Saints’ 18 yard box and resulted in Steven Thomson bringing down Mo Edu. 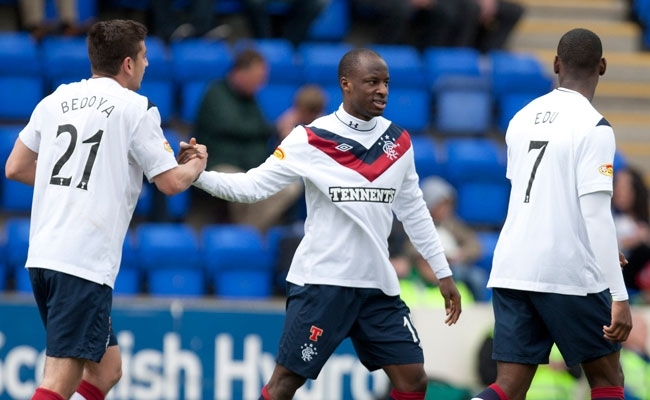 Collum immediately pointed to the spot but Aluko could only hit the post with his effort. The miss gave the visitors an unexpected lift and on 22 minutes Paul McGowan’s neat lob from 30 yards landed on the roof of Allan McGregor’s net after the keeper, who was wearing the club’s red away jersey, had sprinted from his goalline to make a headed clearance and it arrived at the feet of the former Celtic forward. At the other end a slack pass from Mair went straight to Aluko and the Nigerian skipped past two defenders before unleashing a shot which Samson did well to divert out for a corner. On 39 minutes Rangers doubled their advantage when Kerkar’s deflected cross bounced over McCulloch’s head and Little was there to take drive a low, left footed shot beyond Samson from 16 yards. Prior to half time McGregor, who was making his 200th SPL appearance for Rangers, pulled off two world class saves to deny Dougie Imrie and Nigel Hasselbaink which meant the Light Blues were in a strong position after the half time interval. 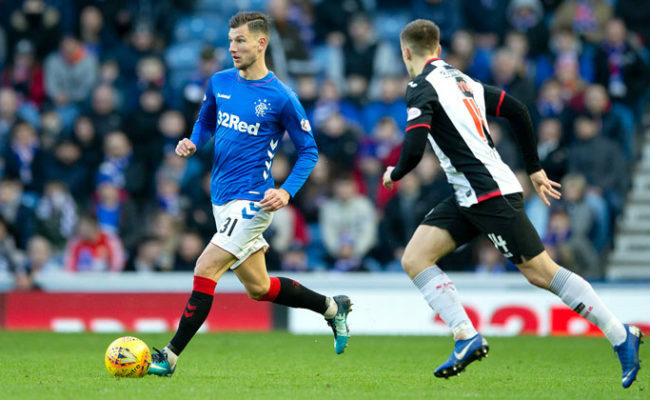 Their lead, however, was cut in half almost immediately after the restart when Goian was guilty of giving away the second penalty of the afternoon as the ball came in from a corner. Saints’ forward McGowan then showed his quality to find the net against McGregor who went the wrong way. 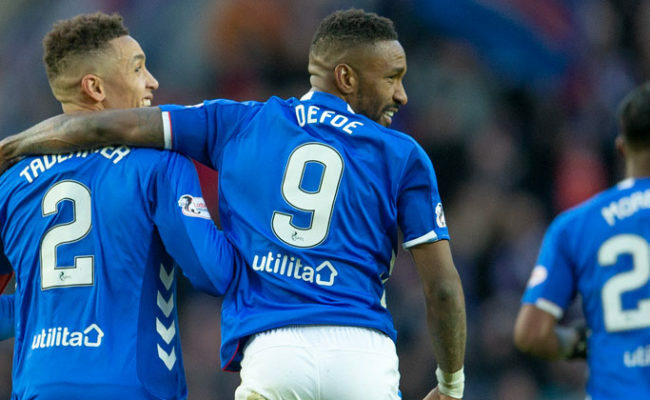 The visitors appeared to be back in the game but on 50 minutes penalty number 3 was awarded, this time for Rangers, after Aluko was fouled by Tesselaar who was correctly sent off having been the last man. McCulloch grabbed the ball but he had his hands on his head when Samson dived to his right to make a stunning block. With just one goal separating the teams McCoist elected to throw on Lafferty and when Collum awarded penalty number 4 before the hour mark it was the big Ulsterman who calmly slotted the ball home to secure all three points. With just 15 minutes remaining Lafferty’s countrymen Andy Mitchell was handed his Ibrox debut in place of Northern Ireland striker Little but by that stage the points were already in the bag. Man of the Match: Lee McCulloch – Jig might have missed a penalty but he again put in a great shift and opened the scoring with a perfectly-placed header.